Hi! Joy Leighton here... Jaymie's mother. I grew up an only child. Christmas was quiet. My grandparents on both sides were the chilly kind, so a kiss on the cheek upon first seeing them after a long time was considered effusive. My husband was an only child too, but everything else in his family was so different, and I've never known quite how to fit in. My husband is a hugger, and so are both of my daughters, especially Jaymie. When Alan and I first started dating I was taken aback at how different Christmas in the Leighton home in Queensville was. Neighbors dropped in Christmas Eve. They all went to church, and sang Christmas carols. The whole family helped seniors in the community, taking baskets and wrapped gifts and cooked food to shut ins as well as to lower income families. My family never did that, preferring to give a sizable cash donation to suitable charities. The Leightons are wonderful... they really are. And Alan is such a good man. Our daughters Becca and Jaymie have grown up to be so Leighton that... well, I'm never sure how to fit in even in my own family. Alan is patient with me, but Jaymie and I have had a strained relationship over the years. This Christmas is going to be different. I heard something in her voice when I talked to her on the phone about her new love interest, Jakob Muller. We're visiting him and his family December 23rd, and I'm going to make an effort and begin with her new boyfriend how I want our relationship to be, warm and loving; I hope she's found love with him. I want that for her. So I'm going to try very hard not to let myself build walls, and instead become a Leighton to the bone, like Alan, Becca and Jaymie. I'm going to open my heart and my arms to Jakob and his daughter. Having children was the best thing I ever did in my life, and I want that for Jaymie. Have you ever made an effort to change something about yourself? Is it ever too late? 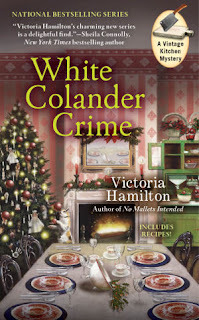 1 - BOOKS: Cozy Cookbook, No Mallets Intended, White Colander Crime, Shadow of a Spout, Death of an English Muffin - FIVE books! 2 - White Colander Crime book tote... for all those books! 3 - Handcrafted beaded bookmark, printed bookmark and 2015 calendar card. 4 - Coloring Book and Watercolor pencils. 5 - Have You Had Tea With The Queen? tea! Merry Christmas, EVERYONE! And Happy Holidays! I had to learn to fit in at work (the department has a different attitude and humor than normal people). SO it has been an interesting adjustment. Thank you for the delightful giveaway. It is never too late. I have little self esteem and am working on it. Thanks for the fabulous giveaway. It is so hard to change! Thank you for the wonderful giveaway. Merry Christmas! I grew up at a time when families lived close to each other and basically lived in each others pockets. I could visit 4 different sets of aunts, or cousins in under a half hour walk. I am the oldest 10 grandchildren and between all of us there are now over 50 grandchildren. We are a loud bunch of huggers. It's often hard to make changes but not impossible and it's never too late to give it a try. I find myself trying to change a little something about myself quite often. Thank you for this awesome giveaway and chance to win. I have had big changes this year with giving up my job to stay home with my Dad and take care of him full time after his stroke. I have tried to change some things but gave up. Some changes are hard and some are easy. I had the opportunity to stay home with my kids and I love it. It's never too late to change, but it's not easy either. It will be easier to change what you do than how you feel about doing it. Good luck with whatever you decide. This awesome, giveaway, and thanks for the chance to win!! Merry Christmas!! This is a great giveaway! Thanks for the chance to win!! I work on myself and evolve daily. Hopefully for the better. No such thing as too late! I met a woman who started sculpting in her 60's ( bought a gorgeous jack in the pulpit tile to remind me) and I am inspired by people who find new abilities and talents and change!! Thanks for doing this giveaway. Love your series. Wow this looks Awesome!! Hope I win! I can share some with family. What a great package!! Merry Christmas! Thank you. Merry Christmas! It is never, ever too late to make a change in yourself. I would love to win this wonderful giveaway. Thank you for the chance to win. What a great giveaway! I've never read any of your books, but would like to! pamela dot fry dot priest at gmail dot com. Thank you! I try to change things about my self somewhat often lately. I think you're never too old to make changes as long as you really want them. My problem is getting myself to commit to a change. Merry Christmas! I'm trying to be a better listener. Not just listening to respond. I find a lot of that at work. Thanks for a chance in this awesome give away. Change is hard for me, but the older I get the more I try to go with the flow. Yes change is possible it's just hard, and has to be a priority. Thanks for a great giveaway. It's never too late. I've found that out. I've changed so much. I think people, and things, are always changing. It is the only constant after all--change. Thank you so much for the giveaway. Happy Holidays!! Change is very difficult for me but it is possible. Love the giveaway! So very generous. Change is a constant thing, always trying to be better. I am just a work in progress even at 64 LOL. Merry Christmas and Happy New Year. Oh my gosh...you are so awesome! Merry Christmas to you! in on the giveaway. 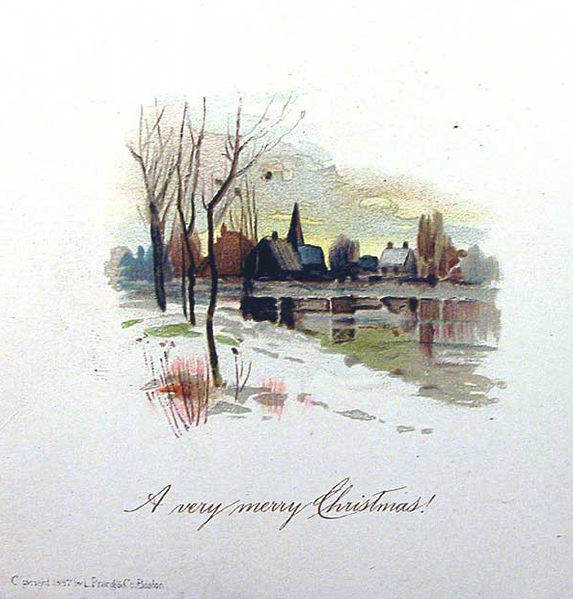 Merry Christmas to all and may the New Year hold all the best for everyone. I try to have a consistent bedtime and wake up time but it gets thrown off all the time with special events. It is tough to do. I was an only child till I was 9 so Christmas was just the 3 of us wherever in the world the army sent us. But by the time I was 10 I had a sister and a brother and Christmas was never quiet again. Now the 3 of us, all 7 of our kids, and this year 3 grandkids all get together at mom's house. Family is what's important. I believe change can be good most of the time. This year a lot has changed in my families life. Most of the change us not been fabulous. Stress and fiancial problems however can make you or break you . I refuse to be broken. My kids are my life . they both are special needs and absolutely amazing. God bless everyone. Merry Christmas and I hope you and your daughter can grow to be the best of friends. Thank you for the giveaway it is very thoughtful of you! We are looking forward to seeing our daughter on Christmas for the first time since August. She, her brother and his girlfriend, my husband and I, all together. It doesn't get much better than that. I just read and really enjoyed the first book in this series and look forward to reading the rest of the books. I was ways super shy and felt like the odd person out most of the time. Bummer! Am born in the wrong country. Some change is good while some isn't necessary. People need to accept people for who they are. The most I've tried to do is to be a little more outgoing. I think it's too late to make a change to your basic makeup/personality, but, if one is SUPER motivated and committed I guess one can. In time of stress though, I'd bet no matter how committed you are, you'd revert. Great giveaway!! I've had to learn to be more tactful at times. Sometimes it works. change is difficult. thanks for the opportunity. My husband's family is much different from my family and I had to adjust to them. Especially during the holidays. Thanks for the opportunity! I am not a huge fan of change, but both of my jobs (teacher and bookseller) involve a great deal of it. It's never to change something about yourself. It's not easy but it can be done. I had to learn not to stress over little stuff. Merry Christmas and Happy New Year. I think it's normal for people to change as they grow. The difference in people is what makes the world go round. And keeps you on your toes! I've tried to lose weight and be more reserved. It's hard to try to be something your not. I wish everyone could learn to like people for who they are and not be so critical and judgemental. It's not easy to change, but I try to be more patient with others. Thanks for this great giveaway. Peace and Joy come to us! Change comes with growth, reading can be peaceful and can also help us grow. Reading cozies brings me great pleasure. Thanks for the give away! Winning this prize would be better than winning the lottery! Thanks for the opportunity! It's never too late to change, but you really have to want to change. I'm so set in my ways...I don't think there's a lot I would change myself...though I know a few things I should! Change is good. Great giveaway! Thanks. I don't deal with change very well. Even changes for the better. Thanks for the giveaway! I'm always trying to change myself so that I'm not so afraid of being in groups of people. Everyone thinks I'm unfriendly, but I'm just scared. I grew up with little touching and no expressions of love. I have been working to change this for 40 years, but it still feels a little awkward. No, I don't think it's ever too late to try to change--I don't particularly like being bubbly, but have to pull that off at work. Merry Christmas and thanks for the fun giveaway! Great prize! Would love to win. Change for the better is always good. I love cozy mysteries. Change something? All the time...I think it's a work in progress and his time of year in particular I work on being kinder, more patient and I am going to add meditate more which really helps lol...Thanks for the contest. Each Christmas I remind myself to be more patient, more open. Christmas and the New Year are a great time to work on change. I would LOVE to win this prize! I love this site and I enter every day! 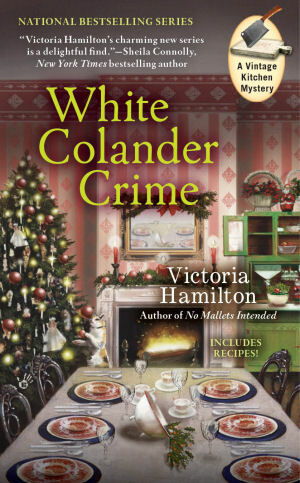 Cozy mysteries are my favorites! The authors on this site are amazing!! Happy holidays to all!! Wow! What an awesome giveaway. It's never too late to re-invent yourself! At least that's what they tell me, and I try to live by that and each making each new invention better than the last! I do keep trying to make myself better but it is very hard! Will I ever grow up? Who hasn't tried to change the way they look by losing weight, getting a new hairstyle, or wearing more or less make up? I've tried it. Who hasn't sworn to "count to ten" before showing anger or frustration with family or coworkers? I've tried it. Who hasn't? I have and a lot of the time it works. But to change permanently...that requires dedication, encouragement, and drive. Oh yay! 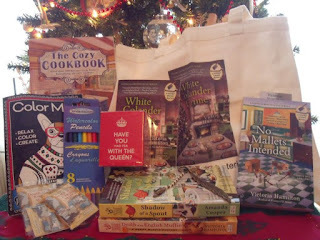 So much fun stuff to win...Merry Christmas! I made myself more outgoing. I use to be extremely shy, and I figured out I was missing out on a lot, So even now, I need to make myself more outgoing. Thanks for the chance of this fabulous giveaway. It's never to late to change. I hope that everyday I grow and learn and become a better person. It's not always an easy thing to do. It is never to late to change something about yourself. Each day we change a little, sometimes without ourselves even knowing. For the big changes, you just need willpower and a goal in mind and you can change to be a better person. Thank you for the chance. This is a great giveaway. This a wonderful give away. Merry Christmas everyone! What a wonderful way to start the giving season! Books! This is great! Thanks! Never to late to change. I try to learn something new everyday! Thanks for the chance! Della at deepotter@peoplepc.com I debated about this. 2 of the books I already have. But I talked to the local library and they don't have any of the Hamilton books. So they will gladly accept if I get this. The other stuff. I would love to have. Especially the Cookbook, tote, book marks, etc. This is such a neat give-away. I have had to adjust to a new way of celebrating Christmas. My family is very loving and demonstrative. Not all families are that way. Thanks you so much, everyone, for entering! I have chosen a winner and emailed her. Check your email! Have a happy holiday season, everyone. Peace. I was born in Germany and my Mom and Oma were very stoic. My Mom kept the aloof attitude for most of our relationship. In the last few years before she died we said I love you after every phone call and hugged after every visit. So yes you can change, I'm glad that we had the last few years together. By the way, this is a fantastic give a way. Every year I work on that organization thing, hoping that one day I will get there. I still hold out hope even though I am still not done with everything. alice.ihnen@charter.net Thank you for the chance to win such a wonderful gift!! Depending on what it is I think. We can change tho it may not be easy . Like losing weight I did over 50lbs and I was in that set of mine and I did it. Well now I need to loose it all over again and I just can seem to do now - go figure. You have to work on it and honestly want to change I quess.